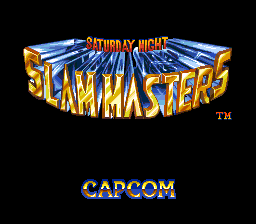 Saturday Night Slam Masters is a fighting/wrestling hybrid arcade game developed by Capcom, originally released for Capcom's CP System Dash arcade hardware in July 1993. The following year it was ported to the Sega Mega Drive and Super NES. In Japan the game is typically known as Muscle Bomber: The Body Explosion, although the Mega Drive port was not released in that region. Nevertheless during development the game featured at Summer CES 1994 under the working title of Muscle Bomber, which may suggest a Japanese version was planned. Saturday Night Slam Masters mixes up Capcom's one-on-one fighting system seen in games like Street Fighter II' (though here there is a vertical plane, similar to what you would typically find in arcade beat-'em-ups of the era), with the rules of professional wrestling. The Mega Drive version allows players to use the full character roster, including bosses, in single player mode, and features an death match mode exclusive to the system. However, possibly due to colour palette restrictions, the 4-player tag team mode present in the Super NES version (wherein a multi-tap is needed) is omitted. Main article: Saturday Night Slam Masters/Magazine articles.